From likes to comments, in our past articles we’ve demonstrated the immense value that comes with having beautiful posts translate into something actionable. This really begins and ends with engaging with your content and furthermore paying equal attention to your followers, partners, and peers and their content. Because when it comes to building a community it really is a two-way street! Though we admit this is no easy feat, and in a sense it is a job all in itself. So when it comes to building a compelling Instagram feed that better speaks to your brand’s values, aesthetic, and products, sometimes it takes turning to an outside source to help build out your brand’s audience. Thankfully PLANOLY has (once again!) thought of just about everything to make this process as streamlined as possible. Introducing… DISCOVER on Planoly, a new feature where you can discover user generated content on both web and iOS app. to make the process streamlined as possible. Many brands choose to use Instagram as a space for inspiration and build their profiles around the idea of creating a digital mood-board. Typically a lot of this content comes from outside sources/platforms or from those they admire. Even for personal use, at some point or another, many (if not all) users have re-posted media from other accounts. 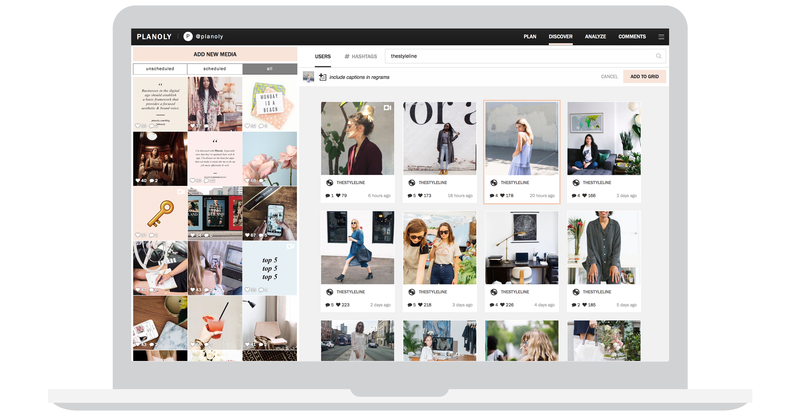 The introduction of Planoly’s DISCOVER feature will streamline this process as it gives users the ability to search for usernames or hashtags and immediately add other’s posts to their Grid when planning out content on Planoly’s web dashboard. Each repost (read: #rePLANOLY) will still have the original username in tact, while allowing the flexibility in crafting your own caption to keep your brand’s Instagram narrative consistent. It’s a win-win if you ask us! PLANOLY’s end-to-end capabilities not only allow you to plan ahead, but analyze the performance of your posts in real-time. With these tools in your arsenal and with Planoly’s DISCOVER feature, these same practices can be applied to reviewing what performs well with both your original content and reposts. This alone will save you time in terms of the logistics of planning and in how you (and what) you search for when it comes to including outside content in your strategy. Timing is everything so use PLANOLY in its entirety to save you the time (and the stress) of figuring out what works best for your feed. If you’re anything like us, you understand the value of solely posting original content. After all what’s a better way to tell the story of/promote your brand by sharing assets you’ve created internally? While this approach is sound, in working with platforms like PLANOLY we’ve come to understand the importance of opening yourself and more importantly your brand up to new collaborative opportunities. We’d say utilizing Planoly’s DISCOVER feature is one step in the right direction. Watch the easy tutorial videos for our web dashboard and iOS app on how to use Planoly’s new DISCOVER feature to discover/search/regram user generated content on Instagram.